Zoo stickers are perfect for embellishing photos taken at the zoo or a wildlife park but to make your scrapbooking page successful, other elements come into play. Your choice of colours is perhaps one of your most important decisions when creating your scrapbooking layout - one that could make or break your designs. This quick double-page layout shows you not only how to incorporate adorable zoo stickers into your scrapbooking designs but also how to combine colour and texture with a balanced geometric design to create an eye-pleasing page. Materials Used: Four shades of Bazzil cardstock, tan cardstock and Doodlebug Zoofari stickers. The first step to creating this layout is effectively selecting colours that match. I began with a base colour of light brown, a colour I thought was quite appropriate for a zoo layout. I then matched three other shades of complimentary browns (two Bazzil and one normal) to it and for contrast, I selected a green Bazzill cardstock. As I am not using a lot of overwhelming patterns on this page, I have opted to mainly use Bazzill cardstock to give my scrapbooking page texture and dimension. It allows me to keep my design simple, but not boring. Constructing this layout is very simple. All you need to do is matt four horizontal photos and place them on your background cardstocks, as shown in the scrapbooking layout above. Then cut four strips of green cardstock and position them in the corners of your page, again, as shown above. Finally, decorate your layout with Doodlebug Zoofari stickers or any other zoo stickers you like. If you wish, you can also add a small square on the right-hand page (see layout above). This could be used either for a smaller photo or journaling. And that’s it! Another great layout in less than half an hour! I’d love to hear what you think of this zoo stickers idea. Please leave a comment in the comments box below. 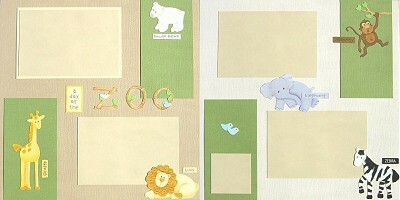 This entry was posted on Tuesday, May 31st, 2011 at 3:39 pm	and is filed under Animals, Scrapbooking Stickers. You can follow any responses to this entry through the RSS 2.0 feed. You can leave a response, or trackback from your own site. producing scales that produce very accurate results. Lower yourself down to the point where you feel comfortable, then raise yourself back up to the starting position. “Insist on quality, brand strategy is the first international background of economic globalization the only way for Chinese enterprises. It’s difficult to find experienced people about this subject, but you seem like you know what you’re talking about! However please assist me, please remark here. that really hoow to do running a blog. It first took 30mins – 1 hour to load something then it started once more!?!?!? Sorry if my ealier answer seemed amittedly insulting. My self control is letting me down when I dont have enough glucose in my system. I will admit myself. Please forgive me. It stimulates me so much. What really can ruin a great relationship is distrust. Just try to work it out. Get medication. Nobody shold deal with anger issues alone. What really can spoil a relationship is cruel jokes. Hi, Neat post. There is an issue along with your web site in internet explorer, might test this? I pay a quicck visit day-to-day a few websites and sites to ead content, exzcept this website provides feature based articles.